One of the stars of Dynamo Moscow’s historic tour of Britain in 1945 was goalkeeper Alexei Khomich. Despite standing at only 5’ 8’’ in height, he had a spectacular leap, and was nicknamed ‘Tiger’ for his bravery between the posts by an admiring British press and public. Khomich was himself the latest in a line of celebrated Russian goalkeepers, dating back to Nikolai Sokolov and including Evgeny Fokin and Valentin Granatkin. 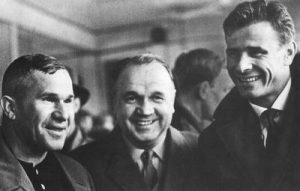 Khomich represented Dynamo with distinction for many years, before becoming a sports photographer, and acted as mentor to his even more celebrated successor, Lev Yashin. The first half provided a match within a match, Russia’s legendary ‘Man in Black’ goalkeeper Lev Yashin against England’s finest goal-poacher Jimmy Greaves. Four times Greaves, the Artful Dodger of the penalty area, worked his way into goalscoring positions. Four times we were convinced he was going to score, and four times the human spider that is Yashin denied him with saves that were at one and the same time spectacular yet made to look simple by this master custodian. 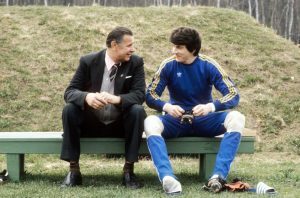 In later years, Yashin in turn served as a mentor to Rinat Dasaev, the next of the great Russian goalkeepers. After joining Spartak Moscow from his home-town club Volgar Astrakhan in 1977, Dasaev was regarded as the best goalkeeper in the country for the next ten years, and one of the world’s finest. He won 91 caps for the Soviet Union, played in the World Cups of 1982, 1986 and 1990, and captained the Soviet side that reached the final of the 1988 European Championship. Towards the end of his career, as the political reforms of glasnost kicked in, he had the opportunity to play in Western Europe. Dasaev joined Sevilla in 1988 but suffered from injuries and struggled to adapt to a different culture; he retired in 1991. Dasaev has since worked as a goalkeeping coach, and regards the national team’s current number one Igor Akinfeev as his heir and the successor to Russia’s goalkeeping dynasty.